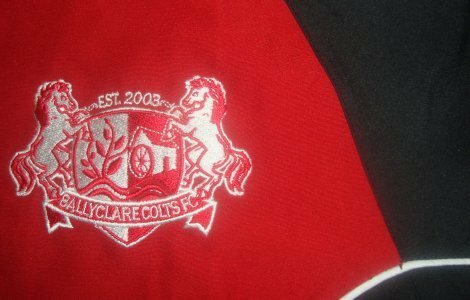 In recent years The Colts have incorparated a Mini Soccer programme within the Club. Currently the programme caters for boys and girls aged between 6 and 10. Within this age group players participate in a non-competitive format of the game, (although someone should have told the kids), with no league tables or scores recorded. As part of the IFA Games Development Programme the players “compete” against other local teams. The programme, which was set up by the Irish FA and local councils, gives younger children the opportunity to develop both their soccer and social skills. Currently the children taking part in the scheme are overseen by local IFA qualified coaches. The training sessions take place within a safe and friendly environment on Tuesday evenings at the Astro Turf pitches, Foundry Lane from 6-7pm. The emphasis is not on the individual alone but also on the importance of teammates and teamwork. Over the past few seasons many participants of the scheme have gone on to play competitively for the club. The majority of our current younger teams, competing in the South Belfast Youth League, are made up of such players. It is our aim to give as many children as possible within the Ballyclare area the chance to come along and enjoy every aspect of our Mini Soccer programme. If you would like more details on how your child can participate in the scheme you can contact us via our Facebook page.